Blatche with Manny V. Pangilinan. Image from netsdaily.com. Andray Blatche arrived in the Philippines last June 8, 2014, the naturalized Filipino is excited and ready to work with his Gilas compatriots. In the interview Blatche said that he is happy to be Filipino and he thanks the Philippines for giving him the once in lifetime chance to play in World Cup. Blatche added “I am Filipino now, so I will do my best to help my team.”. Gilas Pilipinas will be ready for the world cup, they're looking forward to win the event. Seems like its not easy for gilas to win the event, as coach Chot Reyes said "Our chances are slim to none, that’s as honest as I can make it, but we will be fighting with all our hearts,”, still they have the confidence to play in every seconds in the world cup. 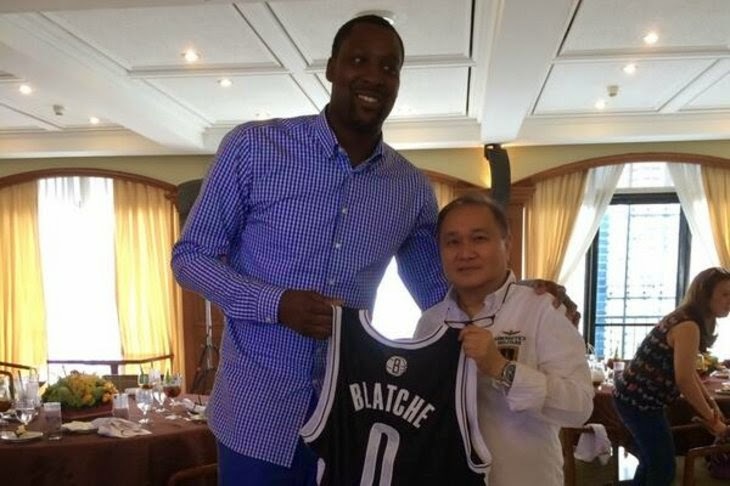 As Blatche is now part of the Gilas Team the chances now are increased. They have now the height, the speed and also the skills. A little chance might become higher on what we expected. The Philippines will be in the group b with the Argentina, Croatia, Senegal, Puerto Rico and Greece. Gilas will start to play in the world cup on August 30, 2014 against Croatia.